The adventurous thrill of being 1353 feet above the ground almost becomes synonymous with fear as you look down upon the monstrous creation of man, pondering your own insignificant and worthless existence in the vast set up of the universe. I have always been scared of heights as a rule; be it the torturous roller coasters that toss you into thin air with utter disregard for life or the thousands of feet high roof top views that mesmerize so many others, these experiences have always left me in a state of frenzied dread. Without the reassurance of solid ground below my feet; my head starts spinning, my stomach ties itself in knots and the knees give away. I am pretty sure there are a decent number of people out there who feel the same way. No matter how hard you try to seek the thrill of excitement by challenging your internal demons of height, the feeling of vertigo doesn’t take long to catch up with you, leaving only one thought on your mind- to stop yourself from falling, falling, and falling into the abyss inexistence. But then unlike us there are some audacious souls who don’t shy away from staring death in the face rather they revel in the morbid trance induced by fearful experiences. Having said all this, TYS presents to you a macabre specimen of architecture that would blow your mind. So hold on tight. 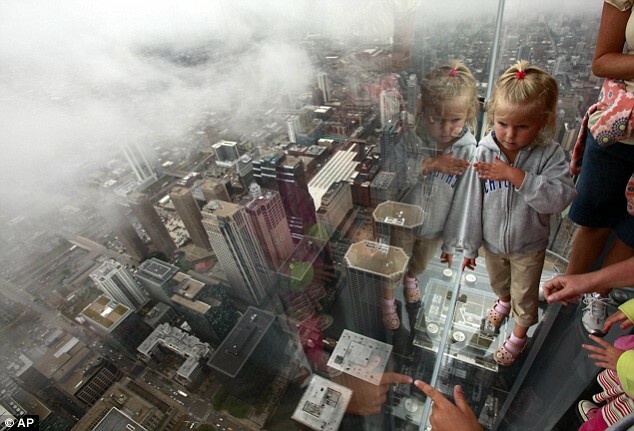 The owners of the tallest building, Sears Tower in the USA have installed four glass box viewing platforms, 10 feet wide and 10 feet tall, which stick out of the building at the height of about 1300 feet. The proud designers of the building want to make the visitors feel as if they are floating above the city by stepping out into the balcony suspended in thin air. 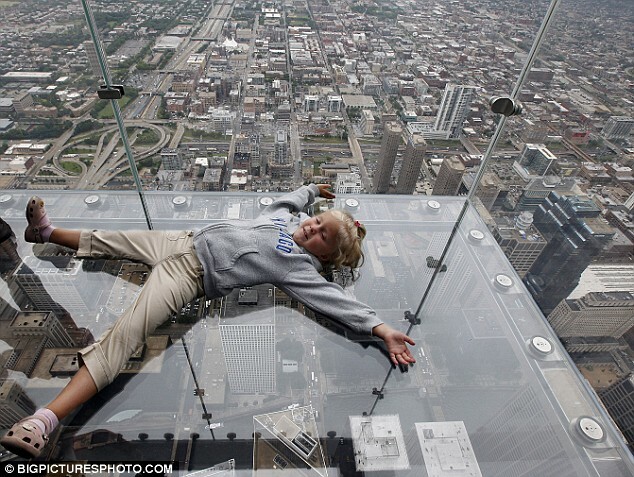 For those who are brave enough to look down, the vantage point offers a phenomenal view of the Chicago city landscape. “It is like walking on ice. 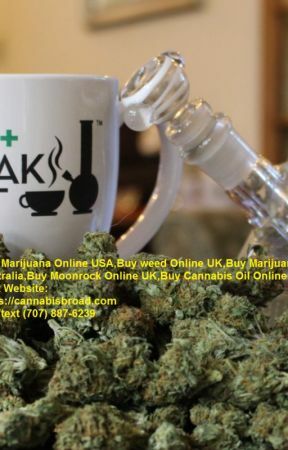 The first step you take you think- Am I going down,” said one of the visitors. 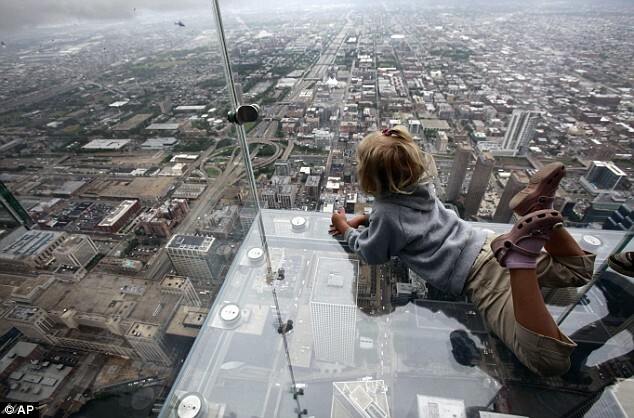 The Sky deck attracts 25000 visitors on clear days. Each of them pay $15 to take a ride up to the in an elevator to reach the deck on the 103rd floor of the 110 story office building that opened in 1973. Although we can’t teleport ourselves to the location of this oddly thrilling sight right this instant, the stunning pictures make up for the wondrous experience all the same, albeit in small parts.